After we left the Catskills on Day 2, we drove north towards the Adirondack mountains. 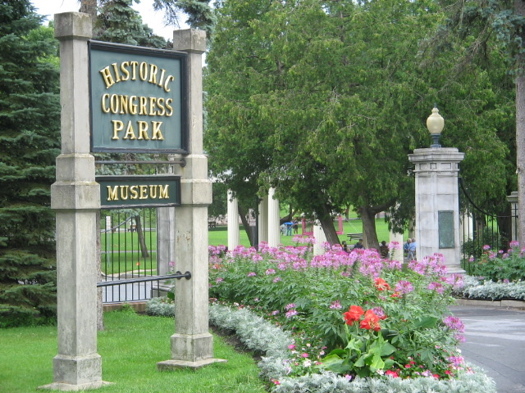 On our way, we made a stop at the beautiful Saratoga Springs Congress Park for lunch and duck-feeding. Silly me did not get pictures of this park, but here is a picture from alloveralbany.com. After lunch, we drove to our campsite at Medcalf Acres in Schroon Lake, NY. Here’s our home for the next two nights. Little B liked to toss things in the river. We had to go after trucks, spoons, pens, and the frisbee twice. That crazy kid. Day 3 – A hike up Mt. Jo with beautiful views. Time to go back down the mountain. I don’t know how he carried B up and down this mountain. I had difficulty just getting myself up the thing. Also note the bug spray in tow…very important! Day 3 (cont.) – After our hike, we went to Lake Placid for lunch at Lake Placid Pub & Brewery (a great place to take kids – they have a kids room with a ton of toys!) and a quick driving tour. Day 4 – Ate our cereal, packed up the car, and headed out on the road again. Thanks! It’s fun to relive it this way. 🙂 I’m not done yet though…many more pictures to come! Thanks for sharing! Can’t wait to read & see more.